Our family grows a lot of organic food in our yard. By virtue of the fact that we live in Agricultural Zone 7b in Greenville, SC, we get to enjoy relatively warm/moderate temperatures throughout the year, although our winters can get quite cold (nighttime low temps have hit the single digits the past few years). Nevertheless, we’re able to grow food indoors AND in our yard 365 days per year. Yep, the afternoon after it hit five degrees, we uncovered our low tunnel beds and harvested spinach, kale, miner’s lettuce, chickweed, and cilantro for a salad. The National Gardening Association estimates that for every $1 you invest into your garden, you get $8 back. 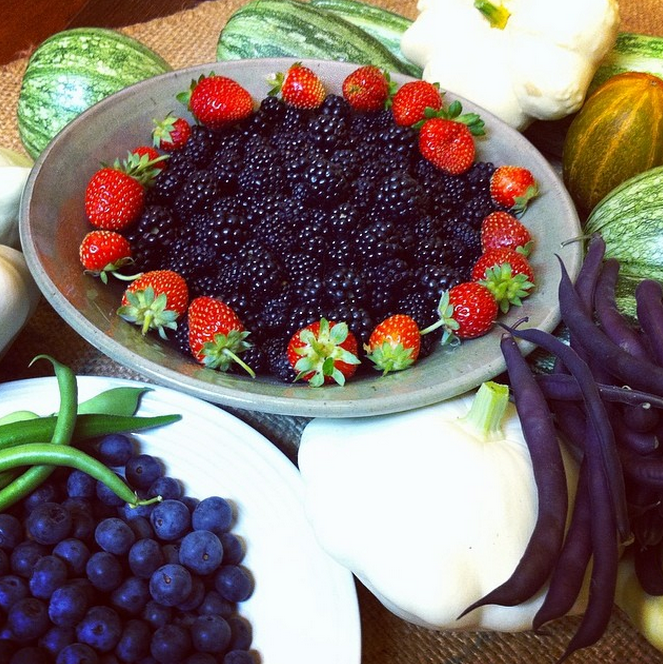 It’s so gratifying to get daily garden harvests like this! 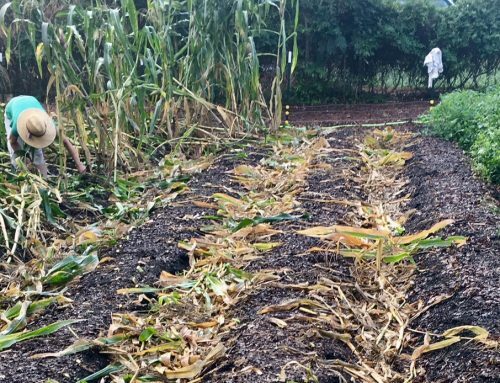 We love helping people learn how to maximize their Return On Investment (ROI) in their garden, get huge yields, and do it all using organic/permaculture growing methods. Of course, organic gardening has a range of benefits that extend far beyond money, as we’ve stated elsewhere. The highest ROI comes from the stuff you can get or use for free. For instance, most people bag and throw out their fall leaves. 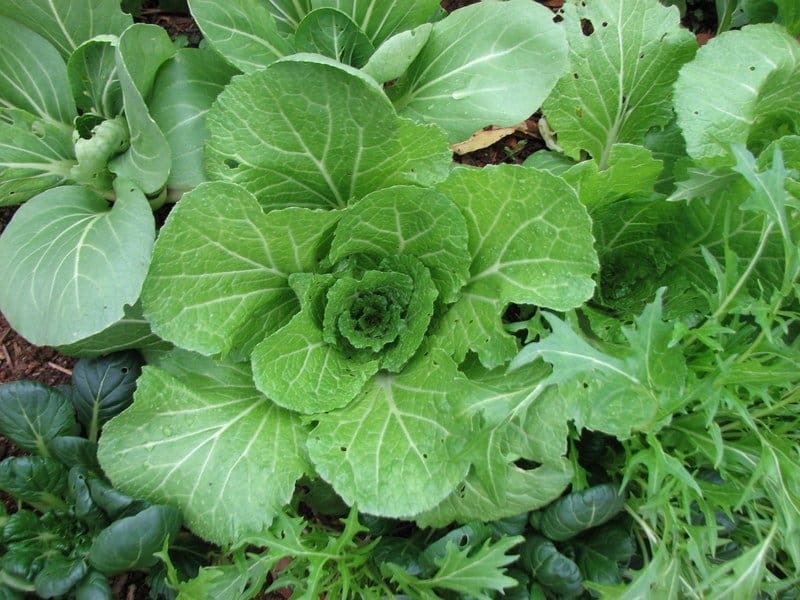 However, leaves are an incredible source of free nutrition that you can use to feed your beneficial soil microbes, which ultimately produces more delicious organic food for you. With a couple hours of work, you can get hundreds or even thousands of dollars in return if you use those leaves for your garden. Some of the other high-ROI things you can do in your garden do require an initial upfront investment of cash. 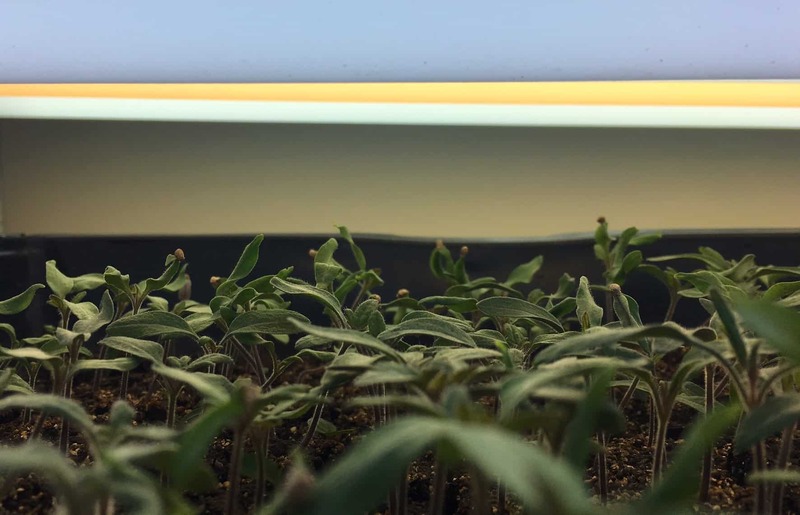 For us, one of the things that has made the biggest difference—and created the highest ROI—is making an indoor DIY grow light system. Our DIY indoor grow light system. The shelves are lonely in this picture, but for most of the year, they’re full of plants and seedlings. In our Ag Zone, we start our spring and summer seeds indoors in late January through February, then transplant them outdoors after the last frost date. This gives us (and our plants) a 2-3 month head start on the warm weather growing season. Translation: we get to start harvesting much earlier and for much longer than if we were to direct sow our seeds outdoors once the weather warmed up. Trays of fall seedlings started indoors in late July/early August under our grow lights will be transplanted outdoors in September. The same thing is true when we start our fall/winter seeds indoors in July-August, then transplant the seedlings outdoors in September-October. Also, if you’ve ever started seeds indoors without grow lights, you might also realize how hard it is to get enough sunlight through your windows (even south-facing windows) to keep your plants from getting weak and leggy. There are indoor grow light systems you can use to grow large plants like tomatoes, but that’s not what we’re discussing here. 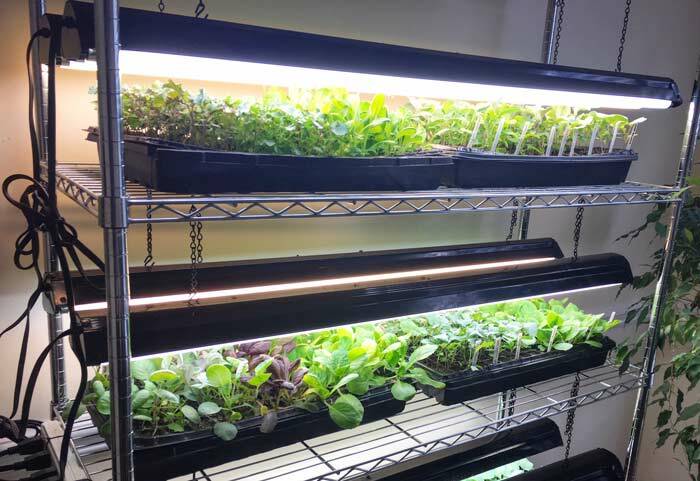 The grow light system we use and recommend is designed for starting seeds for transplanting OR growing smaller plants like lettuces and other greens for indoor harvests. 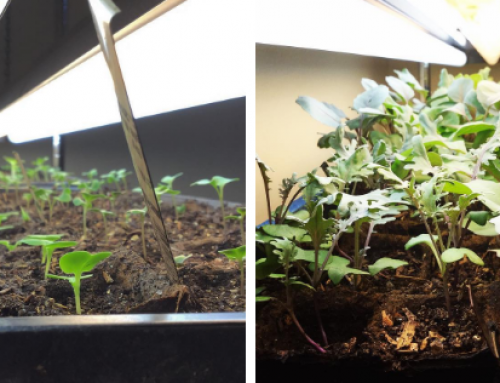 Using the grow light system in this article, you can easily grow enough greens and/or microgreens to get a nice daily harvest. 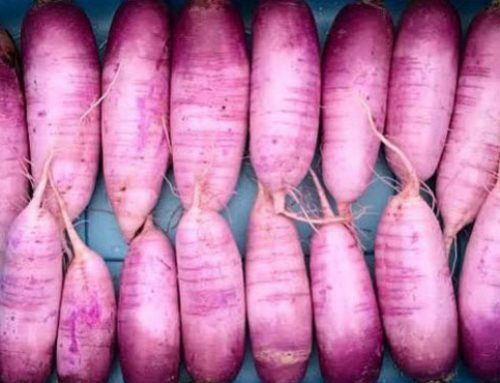 If you live in a particularly cold climate, this benefit might be especially attractive since it’s more difficult for you to grow outdoors during the winter. An array of colorful microgreens growing under our indoor grow light system. Microgreens aren’t just beautiful and tasty, they also pack some serious nutrition. You can read our article about how (and why) to grow microgreens here. We start a lot of seeds indoors and outdoors. No matter where you live, an outdoor growing environment is always going to be a little less “stable” than an indoor growing environment— varying temperatures, soil moisture fluctuations, etc. You’ll use less seeds and have a higher germination rate by starting your seeds indoors under grow lights. Not to mention, there might be hungry insects that are more than happy to chew down an emergent seedling soon after it punches through the soil surface in your garden—not so when you start your seeds indoors. No matter how many times we see it happen, we still get a sense of joy seeing seeds germinate – especially if it’s still freezing cold and dreary outside! 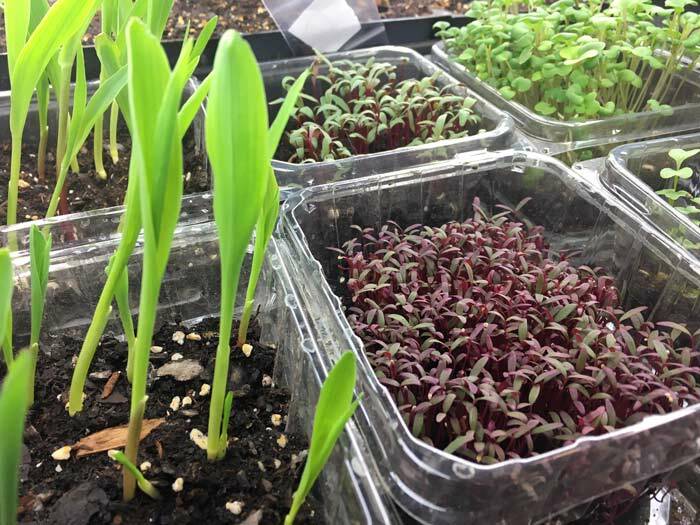 You can improve your seed germination rates and plant survival rates by starting your main seedlings indoors, then transplanting them outdoors once they’re 6-9 weeks old. Plus, if you have an edible landscape, more mature plants are more immediately attractive. Relatively inexpensive and can easily pay for itself in a single growing season. Made with parts that can be ordered from Amazon or found at large home improvement stores like Lowes or Home Depot. Made with parts you never have to replace (except for the lightbulbs which need to be replaced every 10,000-50,000 light hours depending on manufacturer’s recommendations or visual signs that your plants are getting inadequate levels of light). Made with adjustable parts so you can raise or lower each row or each light, AND remove or add shelves as needed. 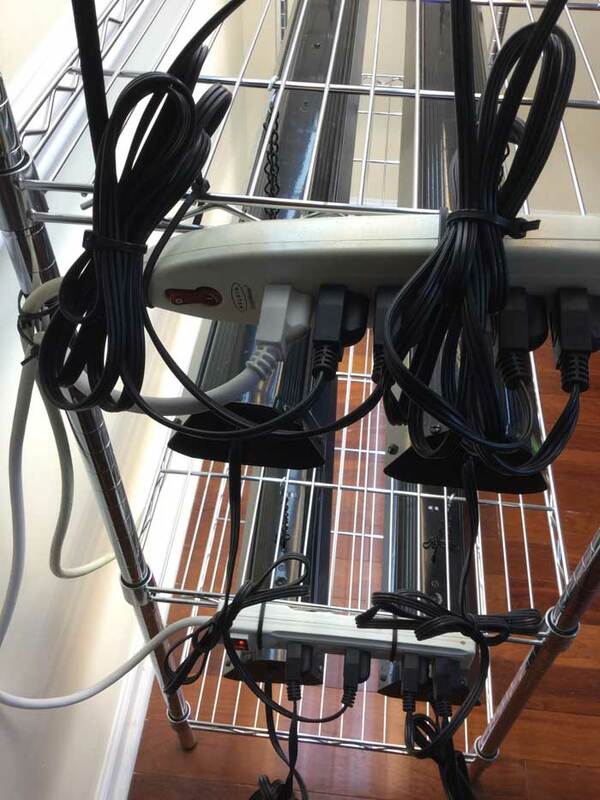 Option 1: LARGE Grow Light System – Five shelf system (74-in H x 48-in W x 18-in D). Technically, this system has 6 shelves, but you can’t hang lights above the top shelf, so there are only five shelves to put seed flats on. This LARGE Grow Light System is ideal if you’re growing plants for a large garden/edible landscape or if you plan to start/grow hundreds of plants indoors at the same time. 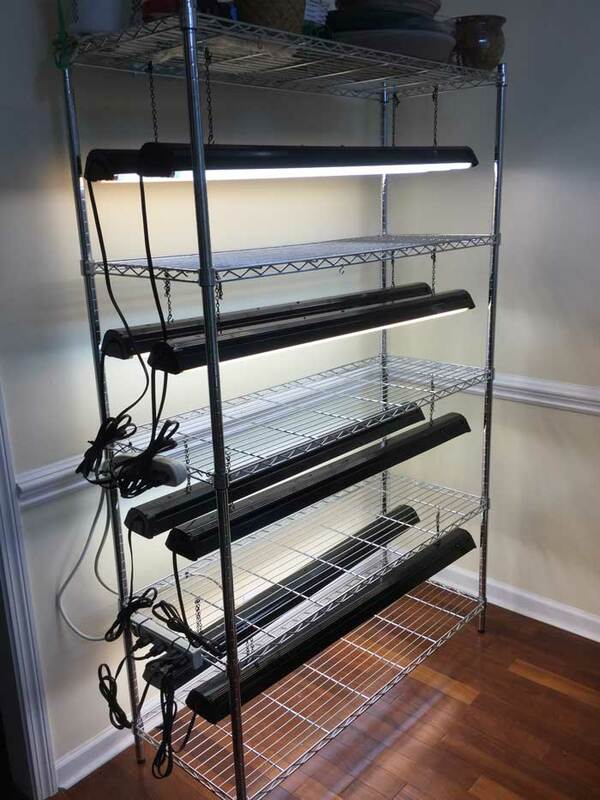 Option 2: SMALL Grow Light System – Two shelf system (30-in H x 24-in W x 14-in D). Technically, this system has 3 shelves, but you can’t hang lights above the top shelf, so there are only two shelves to put seed flats on. The SMALL Grow Light System is ideal if you’re growing in a smaller garden/edible landscape or if you only plan to start/grow less than a hundred plants indoors at the same time. Open Oval Chain (black finish) – product link | quantity needed: 1 ft strips x 20 total strips | cost: $27.25 (whole roll, 50′) Depending on the lights you get, you may not need the chain since chains are sometimes included with the lights. LIGHTING: Choose EITHER LED OR Fluorescent Lights. LEDs may be a touch more expensive up-front, but costs are quickly coming down on them and the benefit of having healthier plants may outweigh the expense. 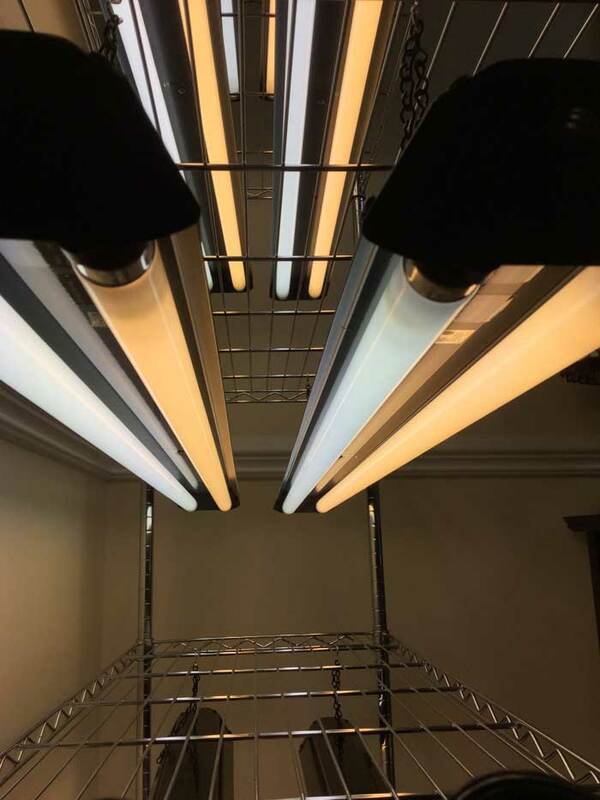 If you use fluorescent shop lights, S-hooks and chains allow you to hang your grow lights and adjust the distance between the bulbs and the plants as-needed (and as the plants grow taller). Note: You may be able to find fluorescent shop light housing + 24″ warm and cool light fluorescent bulbs at you local Lowes or Home Depot, but those items seem to be very rare now. Plus, that setup will actually cost about twice as much as the LED setup we recommend above. As you probably know, light is essential for plant health/growth. Sunlight contains ROYGBIV, the full spectrum of colors of the rainbow that we all learned about in kindergarten. The two most critically important light spectrums are RED and BLUE light. Red spectrum light stimulates growth and flowering, but too much red light leads to tall, weak plants. Blue spectrum light regulates the proper amount and distribution of plant growth, ensuring that all parts of the plant take on the proper size, shape and density. “Cool white” fluorescent bulbs offer Y/G/B (yellow, green, blue) spectrum lights for your plants. Cool bulbs have a kelvin range between 5000 – 6000K. “Warm white” provides O/R (orange, red) spectrum light. Warm bulbs have a kelvin range between 2700 – 3500K. So, install alternating cool and warm fluorescent bulbs into your light housing as indicated in the materials list above and shown in the image below. This way, you can mimic nearly the entire color spectrum of the sun, thus growing healthy seedlings and plants. Alternating cool and warm fluorescent shop light bulbs. The bulbs don’t actually look red or blue to the naked eye. 1. How much indoor light hours do your plants need? Answer: Each type of plant is a little different, but generally speaking, your edible garden plants will do fine with 10-14 hours of indoor light per day. You can buy a timer if you want or just set an alert on your phone/calendar to remind you to turn the lights on in the morning and off at night. Just like people, plants need darkness/rest, so try not to forget to turn your lights off. More tips: 1) Plug one power strip into the other power strip so that you can just flip a single switch to turn all the lights on or off. 2) Use zip ties to attach your power strips to the side of your shelving unit AND to keep the power chords neat and organized. 2. How close do you let your plants go to the fluorescent grow lights? Answer: Keep your plants about 2-3″ from your fluorescent lights. If your plants start looking thin, leggy and weak, move the lights closer to the tops of your plants using your adjustable chains and S-hooks. If the leaves get scalded, move your lights higher (very unlikely to happen unless your plants are directly touching the bulb). Tomato seedlings being started indoors in February. Notice how close the lights are to the top of the plants – we keep the lights a few inches overhead. If the lights are touching the plants, your plants may get sunburn; if they’re too far away, your plants may become weak and leggy. 3. How often do I have to replace my fluorescent bulbs? Answer: It depends on the bulbs you buy. Each manufacturer puts the estimated “lamp life” on the specs, which are often 20,000+ light hours. After a few years, if your bulbs are still working but your seedlings seem like they’re not growing as well, you may want to consider replacing them early. 4. What about growing under LED bulbs/lights? Growing plants under LED bulbs is a little more complicated. Sprouts & young seedlings – For sprouts and seedlings, you’ll want the tops of your plants to be 24-28″ overhead. 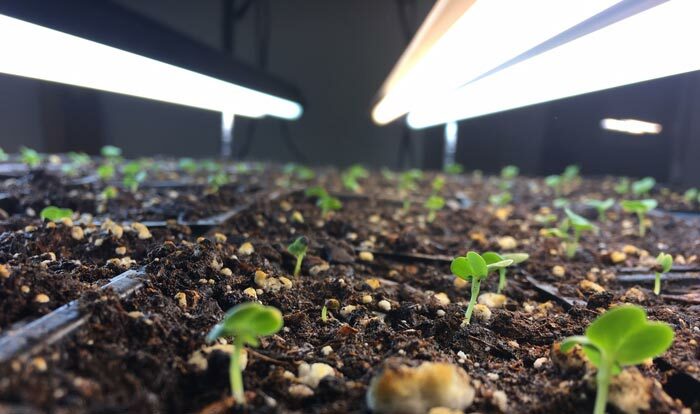 Growth stage – After your seedlings are a few weeks old, you can lower the LED lights to 18-24″ over the top of your plants. Flowering/fruiting – If you’re growing plants all the way to production (ex. growing strawberries or tomatoes), you’ll want to lower your LED lights to a height of 12-18″ during this stage of development. 5. What trays, cells, etc. should I get and what starting mix should I get/make? More info – We have three free seed starting video classes (plus a free ebook) if you want to get the answers to all your seed starting questions. Plus, we also have a detailed guide showing you how to use Ladbrooke Soil Blocks. How do you grow tomato’s in your home? Saying I just didn’t want to grow outdoors! Also, say ok, I want to grow outdoors but want the tomato plant to grow big and get tomato’s on it which would require self pollinating: how do I go about that? Jason: This grow light setup is for seed starting – getting the plants about 6-10 weeks down the road before transplanting them outdoors. It wouldn’t grow large plants like tomatoes all the way to maturity very well because the overhead lights wouldn’t be able to get to the lower leaves of a plant that tall. There are indoor grow light systems for that sort of thing, but they’re much different than what we’ve got here. As for pollinating tomatoes, they’re actually quite easy to pollinate since they have perfect flowers. Just wiggle the plants by hand and the flowers will self-pollinate. Your smaller set up seems to not work with those 48″lights which are way too big. Is this an error? Thanks Marjet! You’re correct. I just updated the article with info for 24″ fluorescent bulbs and housing units. This is awesome and full of valuable information. Thank you! I cannot find parts 2 and three of this thread. Can you please send me the link? Kelly, we’ll be publishing a three part video class/tutorial with all of the seed starting instructions. Sorry it’s not on our blog yet! Leggy, does that mean tall with week stems? Sean: Yes, exactly. Due to inadequate light, the plants are stretching upward rapidly to try to reach more light/sun, which eventually causes their stems to snap and the seedling to die, if more light isn’t provided first. We got tired of throwing away flimsy trays at the end of each growing season, so we now prefer these because they’re BPA-Free, SUPER durable, and also created by a local (to us) NC farmer who needed supplies that lasted longer than the current options: 5-pack (http://amzn.to/2kgWXFV) / 10-pack: http://amzn.to/2jjELeU. Can you please give information about the trays for this set-up? Depending on the type of seed we’re growing, we use either Ladbrooke soil blocks (more advanced method), plastic cells, or biodegradable cells. IMO biodegradable cells are the easiest for beginners but they can dry out more quickly than plastic cells. Much appreciated. i just bought the supplies for the large setup and am excited to get it ready. What are your thoughts on T8/T5/LED lights? Hi Kerry! First, you might have noticed that there’s a smaller setup that we gave instructions for too. That could give you a few more options about where to put it – and if you’re only using it for a few months a year, your daughter might be more forgiving. You could break it down and put it in the basement when it’s not in use. However, if you do put your grow lights in the basement, your cool weather seed varieties should grow fine so long as the temps stay 40+ degrees. Note the germination temps on your seed packets as many cool weather varieties still prefer relatively warm germination temps – 60+ degrees. Where you’d probably be challenged is starting warm weather varieties (tomatoes, peppers, ground cherries, etc) as they are going to need warmth to both germinate and grow – 75+ degrees is ideal. If you have heated seedling mats you could make that work or maybe even get a small space heater and sequester that area off to keep it warmer than the surrounding room. Can’t wait to see more Instagram photos from your summer garden & butterfly adventures! Glad to hear that! My dad will be thrilled to know that his advice was helpful. Re Monarchs on your fennel – we see a lot of Swallowtails on ours, but not a lot of Monarchs, whose larvae feed exclusively on milkweed. Do you guys have overwintering Monarch chrysalides on your fennel? That would be interesting! Hi David! The domes are great for keeping humidity in when you’re trying to get your seeds to germinate. However, you’ll want to take the dome off AFTER your seeds germinate otherwise you’ll likely end up with too much moisture for the seedlings, which will cause “damping off” (a fungal disease which causes your plants to wilt and die). If you don’t use a dome, you’ll need to use a spray bottle a couple times a day to keep the seeds nice and damp and/or put something else over the top to help trap moisture. Do you reuse trays and if so, how do you sterilize so prevent or stop any disease? We usually rinse and solarize our trays as soon as we transplant seedlings out of them (that’s a fancy way of saying put them in the sun to burn out any possible pathogens). You can also give them a bath in hot soapy water right before using them. Some people also give them a bath in water-bleach solution. 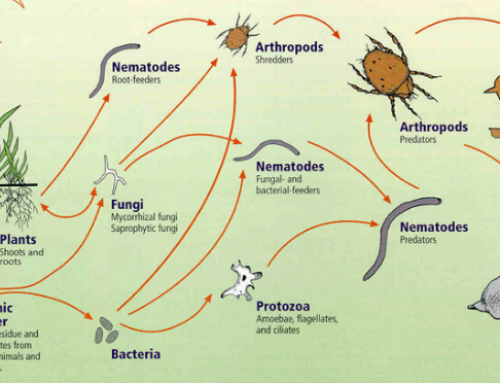 If you use things like worm casting and compost in your seed starting mix, the symbiont/beneficial microbes will also help prevent pathogenic microorganisms from over-proliferating. Hello! When using this light system indoors should I also use heat mats for germination? Or will the light provide enough heat to start the seeds? Thanks! Sofia: it depends. For your cool weather seed varieties (brassicas, lettuce, chicory, etc) there’s no reason to use a heat mat because their germination temperatures are relatively low. However, for things like tomatoes and eggplants whose ideal germ temp are 75-80 degrees, a heat mat will allow you to get high germination and happy, vigorous seedlings. The florescent lights really don’t emit that much heat – that’s one of the reasons they’re so energy efficient. They may add about 5 degrees to your seed trays if you keep them really low to the soil surface (2-3 inches). Sorry if this is too much info and/or not a direct answer to your question! Thanks for the information and quick reply! I appreciate it! We tried to build your small set up and used the link you provided for the warm fluorescent lights, and the link brought me to Amazon, but the lights were only 22″ and not 24″ that we needed. I will be sending those lights back and ordering the right sized lights at double the price. Please consider updating your website accordingly. Thanks for all the information provided. Thanks for letting us know about the mistake, Ryan! The original 24″ Amazon warm fluorescents we had linked stopped being offered a while back, so we switched the link to a new product which is unfortunately too small (as you found out). It’s surprisingly hard to find a 24″ warm light fluorescent (warm = 2700 – 3500k) and there are none that match those specs under regular fluorescent bulbs on Amazon. However, there is one that will work listed under aquarium bulbs that is 2700k: http://amzn.to/2p1nYf4 ($9.97/each). We’ve just updated the article with the new info. Thanks again! If i want to primarily grow lettuce and greens for consumption year round, what trays/containers should i use? How does your light setup compare to T5s? We especially like the trays from Bootstrap Farmer. They look like regular seed starting trays but they’re way sturdier and longer-lasting. Standard seed starting trays are pretty flimsy and will crack and have to be recycled after 1-2 seasons of use. Our Bootstrap Farmer trays take a beating but still work as well as the day we got them. That’s especially important if you’re growing indoors because you don’t want to end up with soil-stained water all over your floors. If you go to our seed starting materials page here: https://www.growjourney.com/curated-organic-gardening-products/organic-seed-starting-supplies/, I’d recommend you get two things: 1) the heavy duty Bootstrap Farmer seed starting trays (top left of the page), and 2) soil block mesh trays (farther down the page in the soil block section). The mesh trays are nice to have as inserts in your solid trays because you can lift out all the plants and soil at once without damaging them. So, for instance, if you accidentally over-water which can kill your plants, you can just lift your lettuce out dump the water left in your trays, and plop the lettuce back in the tray. Does that make sense and answer your question? Also, you said the warm 24″ bulbs are hard to come by. I’m finding lotsof different options so i must be missing something. I don’t have a lot of garden space outside. How would I modify the system to accommodate the mature plants? This system is designed for seed starting, not growing large plants all the way to maturity. You could grow smaller plants like lettuce all the way to maturity with this growlight setup, but not larger plants like tomatoes. The challenge with larger plants would be getting adequate light to lower parts of the plant. You’d likely need different lights and possibly reflectors for that. Wish I could provide better recommendations here, but it’s not something I have experience with. Have you ever found it necessary to add reflective material around the rack? I see that pretty frequently with indoor grow lights, but I don’t see that on your setup. Dustin: nope, we have not found that necessary for growing seedlings for outdoor transplant. If we were trying to grow the plants indoors all the way to maturity, something like that might well be necessary. This setup is to act as sunlight Right? So if I was to put small succulents under it, think it would work over the winter? I have some that I propagated this summer and I want them to have adequate sunlight over the winter! Also about the LEDs, if you got warm and cool LEDs that were in the spectrum you mentioned, would that be considered the same? Hi Kayla! Yes, this setup should work fine to overwinter your succulents indoors. I’m not certain if I understood the last part of your question about the LEDs, but just make sure you have a warm and cool light spectrum bulb in each housing unit so that your plants will get the spectrums of light necessary for healthy growth. S-hooks and chains are not listed for materials list for the smaller version. I assume they are still needed? Sorry for the delayed response, Joseph. Your comment was accidentally screened to spam. 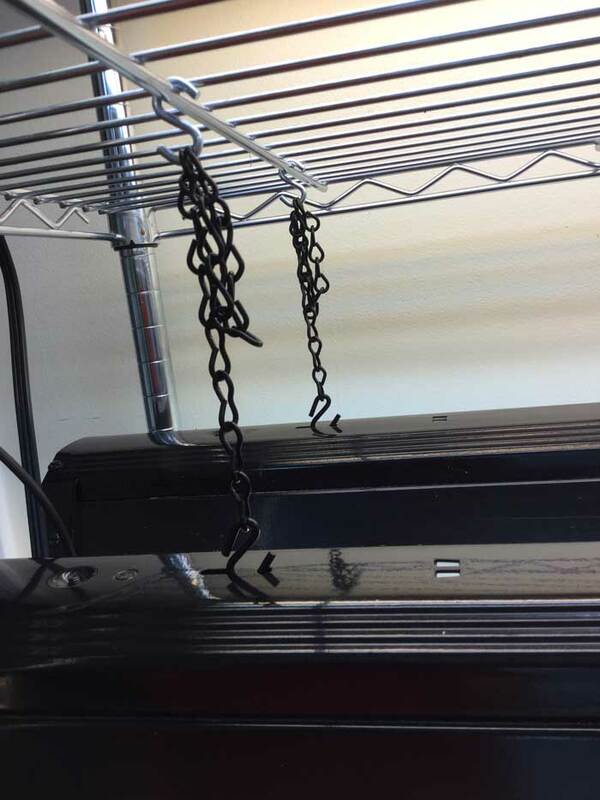 Actually, the reason for that omission is that the LED grow lights we recommend for the smaller setup come with connecting cords and connectors, so chains and s-hooks aren’t necessary. Hope that answers your question! Question on you say to keep the led lights 24 -28 inches from the top of the plants but on the smaller unit the total height is only 30 inches ? Sorry for any confusion on that point, Allen. You’re correct in that the numbers don’t add up there. Those are best practices recommendations, but you can put your LEDs closer to your seedlings and they’ll do fine – especially if you start them out closer to the LED grow lights. You wouldn’t want to give them a jolt from low to high light without a ~1 week graduated transition, for the same reason that you “harden off” your seedlings before transplanting them outdoors. My husband built this set up for me last year and we used Daylight fluorescent bulbs instead of grow lights and were very pleased with the results. 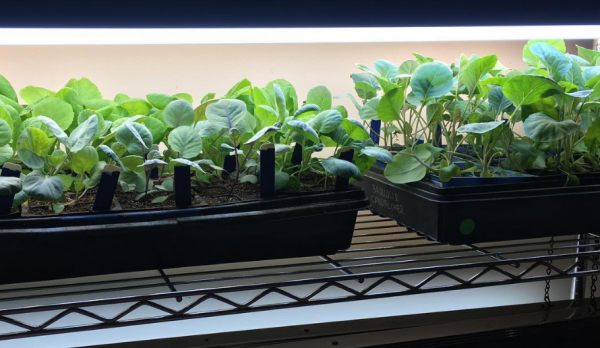 Glad to hear you had good success with your diy grow light system, Paula! We also recommend specific types of fluorescent bulbs in this article, but provide an LED bulb option as well. Do you need to have 2 rows of lights per shelf? What if I only wanted to do 1 set of lights per shelf? We do, but you don’t have to. It depends on how many seed flats you plan to put on each shelf. With a single row of grow lights per shelf, you’ll only be able to do 2 flats going straight down the middle. Even then, plants on the outer edges of the flat may start getting “leggy” due to inadequate light levels. If that happens, you’ll need to start shifting the seed flats directly under the lights a couple of times each day to make sure every seedling gets enough light. With two rows of grow lights per shelf, this isn’t a problem. In fact, during the months when we’re starting TONS of seedlings, we’ll do four seed flats per shelf, and shift each flat back and forth directly under the lights a few times each day. Hope that helps! Worked great but the shelves were way too close together with the 6 shelves. Solution: I bought 4 legs and wheels and dismantled the three 6-shelf carts to make four. Two with 4 grow lights and two with 3. Now I can put chains on to raise and lower the lights. Thanks Lanell! Any way you can send a picture of your revised grow light setup?